One of my favorite vegetables is definitely Asparagus, sometimes I like the meatier stalks and other times I crave the thin stalks. Asparagus is about as versatile as it gets for a vegetable because it just can be paired up or eaten on its own and it tastes great. You might have had the experience to dine on under-cooked asparagus or over-cooked asparagus and both are about as appealing as eating raw ground beef. Under-cooked asparagus can taste clay-like (yes I have tried it) and over-cooked is just a hot mess that mushes and totally misses its calling on the delivery of yum. The best asparagus I have ever experienced has been prepared in an electric pressure cooker, in fact, my Instant Pot. The steaming from this pressure cooker is simple perfection and can not be traded for any other. I am now going to share with you how to lavishly indulge in the best pressure cooker asparagus you will taste and the secret is that it takes minimum preparation to create! First things first, you can not prepare this dish unless you have an Instant Pot. If you don’t know about Instant Pots yet, I highly recommend getting one of these and save yourself some serious time. I used my Instant Pot to create this dish, over and over, night after night for one full week to make sure that each and every time I was not imagining how wonderful this tasted and my poor family members were also subject to the nightly tasting. 1 A pound of Asparagus – cleaned and 1″ snapped off. You are taking the woody part of the stalk off as it is too tough to chew. Use FAT Asparagus to get NON MUSH. When the 1 minutes are up, Quick Release Method. Act Fast or it will sog! Invest in an Instant Pot. Pressure Cookers are so impressive and then you can cook up a storm! Clean the asparagus working from the base upward, snapping off about 1″ of the woody stalk, the asparagus will snap pretty much where it needs to be snapped off from. Rinse very well as dirt in the tips can taste so gritty and ruin what you create. Steamed asparagus can be used as a side dish, main dish, for dinner, lunch, and breakfast. Balsamic is a perfect accompaniment if you are looking for a boost of flavor. This recipe is fast, easy and so healthy. 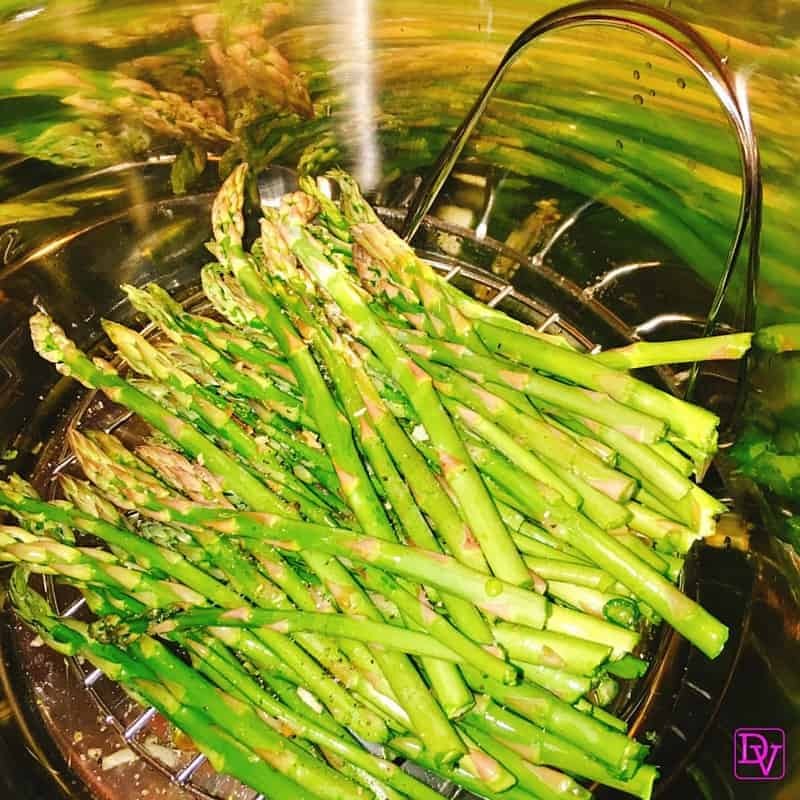 I can not even begin to tell you how many other methods I have used to prepare asparagus without the success and perfection created from the Instant Pot Electric Pressure Cooker. Lavishly live asparagus out loud and steam it in under 2 minutes to perfection with my recipe for the best pressure cooker asparagus. what a nice idea! I made thisvasparagus last week and my husband even took some for lunch the next day. I will be making it this evening as well. Made this tonight and it turned out perfectly. I’m new to the instant pot, so thanks so much. So glad. I use it daily for Asparagus. It is a great tool. Great ay to cook asparagus! Writing from Berlin, Germany to say that I adapted your technique for the white asparagus (Spargel) that is common here. Using the 6-quary Instant Pot Duo60, I peeled TR he tough outer layer (that’s what you must do for this type of asparagus), trimmed the bottom woody part away, and used 1 cup COLD water and the metal steamer trivet on which I stacked the Spargel. Steam on high pressure plus FOUR (4) minutes and a quick release at end gave perfect results. Spargel is about twice the size of the green of your test, so I guessed (correctly!) at twice the cook time. I love that Tammi.. What I have found is that you have to use THICK asparagus for the recipe. I have made that correction. Thin would be to fast to cook and thus, mushy. Some people like asparagus and others don’t. I like it very much, and I’ve been told that this does actually make it taste a lot better. Who knows, maybe this could even make some people who claim not to like asparagus change their mind. Hi Dana! I was excited to try your recipe for steamed asparagus in my InstantPot. Unfortunately, mine was way over cooked. I used an 8 qt InstantPot, which I think takes longer to come up to pressure. Do you think that releasing the pressure as soon as it comes up to pressure would give me the correct amount of time? I’m still new to using my InstantPot! Thank you! I would use steam mode and adjust or once it is at pressure IMMEDIATELY release. What is Onion Onion? I have never seen a product like that. Thanks for your reply. What can I substitute onion onion with (since I don’t have any)? Onion salt? Onion powder? Hi, Tom Riddle! If you liked it I’m sure I will. So glad you liked it, you did see my modifications to recipe yes? Followed your directions to a tee… asparagus was way overcooked. Next time I’ll do 1 minute, and I’m sure it’ll still have some crunch to it. this can vary pot to pot. I have perfection each time. Just cook less back the time down. I like the steaming rack that you have but can’t seem to find one like it. Where did you get it? I picked up an instant pot on amazon special for $70 and this was the first thing I made with it. Lemme tell ya, thank you for posting this, it came out perfect, not too hard not too soft, just right, i mean restaurant quality. My wife ate every bite and she usually leaves a few behind. I am so glad.. that it worked for you. .It is an awesome tool for the kitchen and the recipes just happen:) Congrats.. I am SO glad that this worked for you.. Hearing my readers writing in and affirming:) Is always a plus.. Recipes will just come to you.. work with it and cook daily. Congrats! Wow this is an easy recipe. I usually roast asparagus but would love to try this recipe. I don’t have a pressure cooker but I do love asparagus so my husband and I make that all the time! If we get a pressure cooker we will have to try this. I am so excited to try this! I am in love with my pressure cooker and always looking for new things to make! Asparagus is one of my favorite veggies. I am going to try this recipe! I love asparagus! I hadn’t thought to put it in a pressure cooker, but I bet it cooks really well that way. I have heard so much about the instapot and really want to try one! Maybe I’ll ask for one for Christmas! I love asparagus and this looks so easy and delicious! These instapots are so popular now! I need to get one! This asparagus looks delicious! I’ve never been a big fan of asparagus. I don’t know if it was the taste or the texture of it. I think I might try it again using this recipe to see how the flavors improve the taste of it. You know what – I dont own a pressure cooker! Why not? I totally need to get one since I can use it for everything, including this yummy asparagus! Asparagus is one thing I don’t ever make. I need to change that. My kids love it, as does my husband so this would be a great one to do more often. 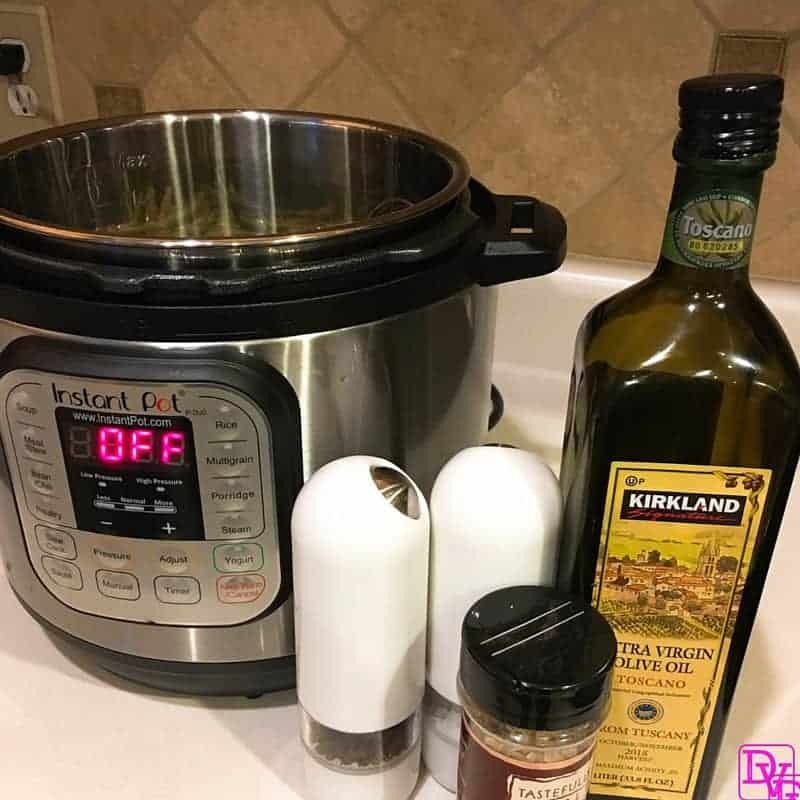 I need an instant pot too I’m thinking, how cool are they! I love asparagus! I always seem to over or under cook it so I will try this method! Thanks for sharing! Tabitha Shakespeare recently posted..Meat & Cheese. Ooooh yum!!! It is Asparagus season here in the South West of Australia and I am thoroughly enjoying it! I pan fry mine with a little bit of Tallow and finish it off with a squeeze of lemon – superb. I would love an Instapot but my husband thinks it would just end up in a cabinet somewhere. I think you asparagus looks delicious and only two minutes! I have this on my Christmas list this year!! Everyone I know that has one loves it!!! I have never cooked with a pressure cooker but it seems easy enough. I do enjoy Asparagus roasted though. Will have to try this when I get my first pressure cooker. Oh these sound so yummy! One day I’ll have room to get one of these and make my life so much easier! The Instant Pot is on my Christmas list for sure. I can’t wait to experiment with it and this super easy asparagus recipe will be on my list. 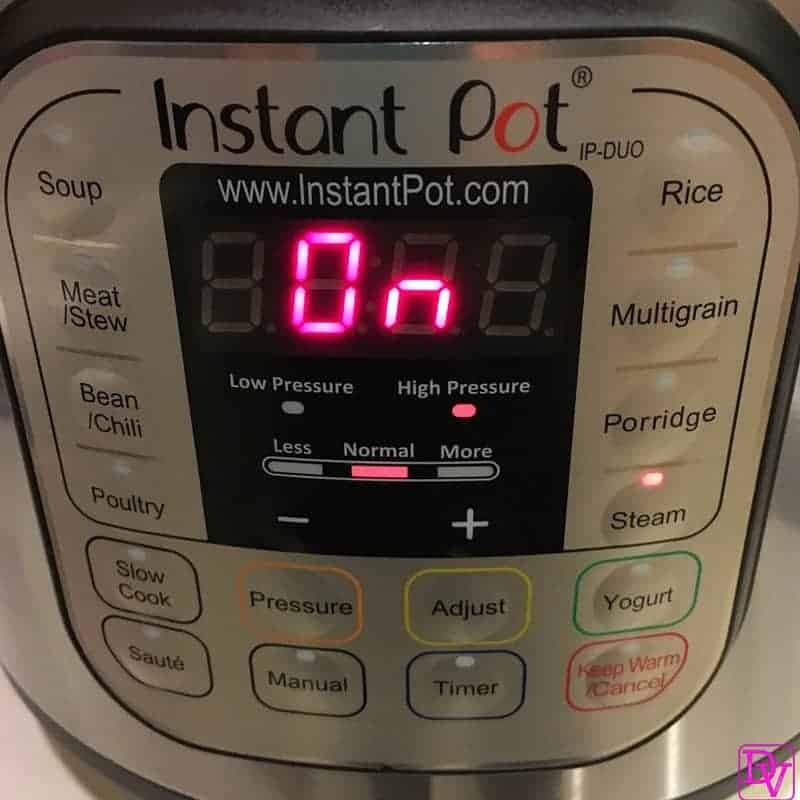 I am so jealous that you have an Instant Pot! I actually REALLY want one since I think they are so cool. I never knew that you could cook asparagus in them. On my Christmas wish list! I’ve been trying to eat a lot more greens and healthy food lately so things like this are stuff that I need! Thank you for sharing your recipe. 😀 I’ll be giving it a shot. This is definitely a healthy food and a quick way to prepare it. Enjoy pressure cooking! I love asparagus for our veggies for dinners. I do not have a pressure cooker and I have never used one but this makes it look super convenient and easy to use. Great recipe! Everyone in our house likes asparagus, but we often cook it on the grill. Sometimes on top of the stove, almost fried. I’ve never thought about a pressure cooker. I’ve heard such good things. With our busy schedule, I am shocked we still have not bought one. Jenn, it is so quick to cook, and it turns out perfect every-time. I too like grilling asparagus..
Should this be crisp/tender after cooking, or should it be soft? Mine was much softer than expected, but I also suspect that I’m having problems with my float, so I’m wondering if it’s possible that my Instant Pot overcooked it. crisp.. 2 minutes is just enough to get it past that CRUNCHY stage but NOT at all to the soft stage.. Check the seal on your pressure cooker. those need replaced often..